Hey! While using the 2X sight variants I had some moments where I just needed to flip the magnification and use the normal Holographic. It would be a great addition to the game, but in current state I think developers should focus more on bug fixing and optimizing. I don't think that's a good idea for the game. Choosing your scope should be a commitment you do that somewhat defines on what ranges you want to pick your fights. Having the best of both world's would break that balance. This is needed. Seeing as the scopes are broken AF, FOV is all kinds of wrong not to mention the fact that when you look down an optic much of it seems transparent/blurred since we have two eyes. This would be a good compromise and could be worth 3 points in coop and 4 in pvp. I think this is something the game needs. Not all magnifiers are always on FTS mounts. It's possible to mount a magnifier with a normal fixed scope mount. Maybe the existing magnified red-dots can stay as they are and add a more expensive version with a FTS mount for balance? It'd also be cool to see switchable magnification on the Specter, which would help distinguish it from the ACOG more. @mefirst Not if you have to use more loadout points to use this sight? WYM? Loadout points are not important. It is the principle that you should not have the best of both worlds. I paid some attention to this while playing last night - the models for the magnifier mounts in the first person view are clearly FTS. We just can't use them. The Specter also clearly has the 1X/4X switch on the side. Elcan makes a fixed 4X model, but that's not what's in game. I understand the reason to keep it non-flippable, the penalty for being magnified. One of the gripes I have is that Looking through magnification especially up to 4x's you cannot see your front sight post in the site. If you are not able to fix the way its modeled due to Engine limitations maybe add in a riser under the site so it will look over the top of the front site post better. 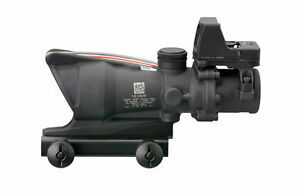 Also would be cool to use the iron sights on the SU230 scope (security x4 optic), so you'd swap to x1 iron sights. The assumption is "more magnification is better". I think this is wrong, and it leads to thinking like "need to decide on scope magnification before match". No, that's why I paid extra points, plus it makes no sense to only offer fixed magnification. Another thing that would solve this are offset iron sights. Since they are not quite as easy to aim with this could provide some balance. And for the flip to side mounts they would block a large amount of vision too. Seeing how these optics cost more than the regular 1x, I'd see the extra supply points being spent being well used if this is possible. Even the Elcan SpecterDR has iron sights on it. Eotech's magnifier system is a fantastic combat optic irl and would be a welcome tactical addition imo. This wouldn't be unbalanced because this is an already common place optic among shooters and adds a level of adaptability to your loadout. Imagine if they brought the ACOG scope over to Security side and put a RMR red dot mounted on top that you could swap to, the scope would cost ~5 or more points. This would be the pinnacle top end choice for optics. In my honest opinion, the CURRENT MODEL of the ACOG doesn't belong on the Insurgent side. I'd like to see them get an older model of the ACOG if anything and give the Insurgents a new optic that has x4/x1 zoom to counter balance the new ACOG/RMR combo that's on Security. No need to make the ACOG into a switchable 1X/4X optic when there is already one in the game. The Elcan SU230 Specter has a big lever on the side that switches it between 1X mode and 4X mode. That lever is even on the model in game, you can see the 1X - 4X markings on the side during weapon animations. I'm not sure how bad for balance a FTS magnifier would be on any of the red dot sights. The magnifier when flipped off to the side is quite the sight obstruction, even in real life with two eyes and a head that moves. Considering there are already people who prefer iron sights over red-dots because they block less of the screen, having a magnifier blocking the entire lower right quadrant of the screen would be a pretty big downside to that type of sight. i feel the magnifier should be extra.. just +1 or +2 to whatever scope you're using, as long as its a x1 sight, as opposed to a whole separate sight. i think it was Medal of Honor that had flippable sights like that, as well as side mounted irons. i think it would translate well enough. flippable sights are pretty common in the military, i had a flipable magnifier on a m68 red dot.